Today is my Birthday. I got some Orange scraps to show you. I got them done earlier in the week as today I was busy busy. My son and husband and I went to the U of A to check out the engineering program. It took a big part of the day. Then we did some shopping and home to celebrate my birthday. I got the 8" spool block done. I just love using as many different fabrics in these as I can. Then the extra little pin wheel too. I made a dent in the 1 1/2" strips with these nine patches. 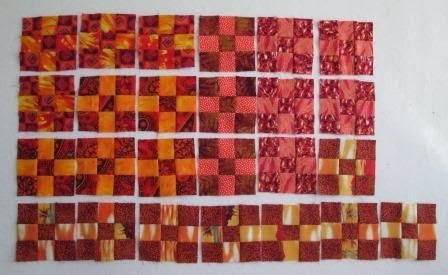 I just love little squares and nine patches fit the bill. To see more orange check out Soscrappy. By the way, love your rich orange blocks. Happy Birthday! Love your spool. Happy birthday! 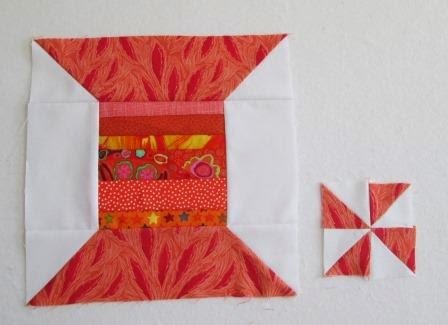 So many happy oranges in your spool block, what a fun way to put strings to good use. Happy Birthday Cathy! Love all your ORANGE blocks - wow!!!!! Happy Birthday, Cathy! Love your blocks, especially the tiny 9s. Happy Birthday and I love how the scraps in the middle of the spool look like thread. And, my...that pinwheel block sure looks tiny. Happy Birthday!!! Hope the puppy left your blocks alone today. LOL I have to chase mine to get kits and fabric from his mouth--too much energy in that one little pup. Hope you enjoyed your day. Happy Birthday! Mine was yesterday . . . family and fun - the best! Where did you find the 8" spool design?